(Natural News) Want to get the most yield and the biggest tubers from your crop of potatoes, protect them from certain pests and weeds, and not use any artificial chemicals? An American study reported that adding straw mulch to the soil around emerging potatoes will result in bigger, healthier tubers. Mulch was also shown to protect the crops against broadleaf weeds and the potato leafhopper pest. It offered a natural means of controlling some of the more prevalent threats to potato crops. Organic farming is growing increasingly important and popular. This farming style uses natural techniques that improve the yield and profit of crops without resorting to dangerous chemicals like chemical fertilizers, herbicides, and pesticides. How straw mulch application improve the yield of potato crops? For their experiment, the UW Madison researchers chose to plant two different cultivars of potatoes. The Freedom Russet is a late-season cultivar, which means it matures slower but is quite hardy. Meanwhile, the Dark Red Norland is an early-season cultivar. It matures faster than the Freedom Russet, but it is also more susceptible to disease and pests. Crops of these two cultivars were planted and tended in plots using organic farming methods. Some of the plots were tended using a mechanical means of removing any weeds that appeared. Other plots were covered in a light layer of straw mulch once the potato shoots started emerging from the ground. The researchers recorded the total and commercial A-size yields for the plots. They also measured the average size of the tubers of each potato. 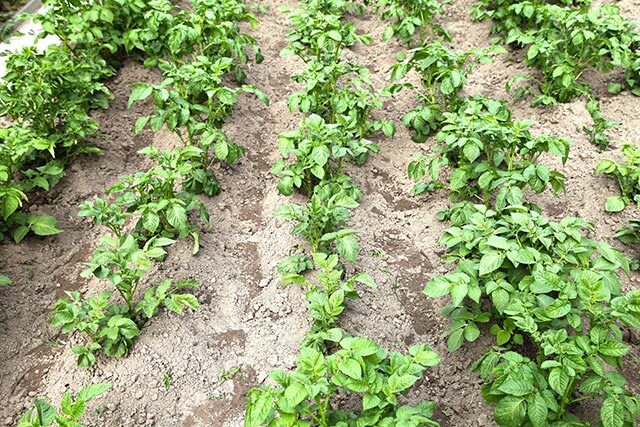 Furthermore, they studied the effects of both organic methods on pests, plant viruses, predatory insects, and weeds that can harm the potato crop. They paid attention to the type of insects, viruses, and weeds that were affected by the cultivation methods, as well as the level of effect on these factors. The UW Madison researchers reported that the addition of straw mulch improved the total and commercial A-size yields for both Freedom Russet and Dark Red Norland cultivars. The tubers of plants that grew in protective mulch also appeared to be bigger in terms of average size. The researchers attributed this effect to straw mulch lowering the levels of environmental stress experienced by the plants, encouraged the growth of bigger and healthier tubers. Furthermore, the mulch was able to reduce the growth of some broadleaf weeds that infested the plots. The soil material performed better than mechanical weeding that often fails to fully pull out the weeds. The suppressive effect was especially visible in the late-season cultivar. Broadleaf weeds were shown to grow in mechanically cultivated plots while struggling to spread in mulched plots. However, straw mulch did not seem to have any effect on the growth and spread of grassy weeds. Regarding its effect on pests and pathogens, the mulch only appeared to reduce the populations of potato leafhoppers, plant-eating insects that can cause serious damage to potato crops. The treatment did not affect any other common pest, predator, or pathogen associated with potatoes, such as the potato virus Y. Given the outcome of their report, the UW Madison researchers concluded that straw mulch application can improve the tuber size and yield of potato crops. In addition, it offers a means of naturally controlling broadleaf weeds, further improving the productivity of the land. To learn more ways of boosting the yield of your crops without using chemicals, visit Harvest.news.